Did you know Arkansas ranks in the top 10 states for wintering bald eagles? The best time to view our nation’s symbol in Arkansas is from December through February. So if you’ve been planning a Hot Springs Arkansas travel getaway, now is the time to do it! DeGray Lake will host their 33rd annual “Eagles Et Cetera” on January 27 & 28. You can enjoy guided bird walks, live bird demonstrations, slide presentations, owl prowls and eagle-watching lake tours. On Friday, don’t miss the live falconry hunt! You will take a short boat ride to an island, then help a hungry hawk flush out game in the wild. If you’re lucky, you’ll get to see a successful hunt where the prey is captured & consumed. We were able to do this last year, and it was absolutely amazing! If you can’t make it that weekend, you might also want to consider “Bald Eagle Bonanza” at Lake Catherine State Park in Hot Springs on January 20-22. 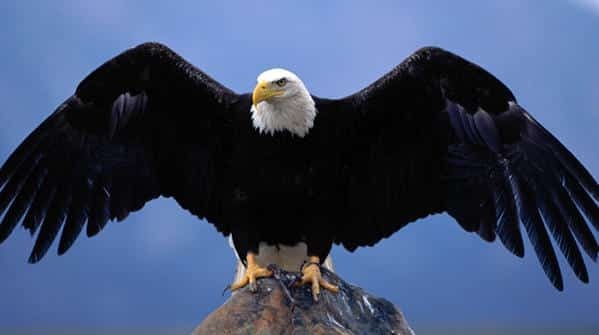 Bald eagles are increasingly staying in Arkansas year-round and nesting, and you can catch an eagle tour nearly any weekend during the winter on an area lake. This entry was posted in area attractions, bird watching, Events, things to do in Hot Springs by admin. Bookmark the permalink.